Review – There was a lot I enjoyed in THE BOOK OF IVY. Ivy didn’t remain a blind follower of her father’s crazy, she stuck to what she felt was true to herself in the end, Bishop wasn’t a saint given a bad rap, the adults weren’t useless, the romance wasn’t the basis for any of Ivy’s eventual motivations and the romance felt genuine. While Bishop went into the “marriage” thinking that Ivy seemed a better fit and he liked what (little) he had seen of her, Ivy went in with only one real thought “he’s not one of us”. It grew over time and small things like unexpected humor, willingness to be equals and similar tastes in things. It wasn’t insta-love. 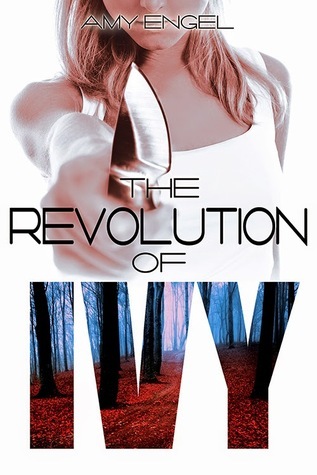 THE REVOLUTION OF IVY therefore had some higher hopes to live up to. Most of which it did. It wasn’t perfect and some of it came together just a bit too conveniently, but at the end of the book I looked back and was not dissatisfied. Ivy, maybe more than in BOOK, proved her resourcefulness here. She acknowledges, early on, that her Father didn’t teach her anything that could be useful so she shrugged and moved on. She didn’t survive so that Bishop could save her, or her father or anyone else. She pushed to survive because she wasn’t ready to give up. She also didn’t dwell on the “what could have beens” with Bishop. She thinks about their time, but her mind is taken up by finding a way to live for the most part. One problem that did carry over for me was my sometimes hard to suppress eye-rolls and disbelief over the world. We’re never given a compelling reason why the world was the way it was, nor does this book explain it. It rather expects you to just go along with it (as to these types of books it seems the author expects the reader to understand that since the main character/narrator doesn’t need to know/find out there’s no reason to info-drop it for the reader’s benefit), which is sometimes REALLY REALLY hard when folk like Mark (who raped, disfigured and nearly killed a child) are treated the same as a woman who refused to be sold off like cattle to be bedded and bred. In the end though the book came together through some borderline miraculous plot conveniences, but I was in it more for the characters. I wanted to see Ivy prevail and prove her family wrong. I wanted to see Bishop come to the same conclusions that Ivy did in regards to standing on your own. I wanted to see Ivy and Bishop get back together with the truth laid out. That’s what I cared about. And Engel delivered on that 100%.